New England sites appeared in several titles such as Old Hartford Election Cake, Connecticut Election Cake and even one Salem Election Cake [in Buckeye Cookery with Old Hartford Election Cake]. Other authors who included Election Cakes ranged from Eliza Leslie, 1840, Esther Howland, 1845, F.I. Gillette, 1887 and Fannie Farmer, 1896. One book, Hartford Election Cake and Other Receipts chiefly from Manuscript Sources, Hartford, 1889, listed eleven different Election Cakes and Election Cake Yeast receipts. Simmons’ late 18th century recipe was composed of huge quantities of flour (38lbs), butter (10 lbs), sugar (14 lb), raisins (12 lbs), a quart of yeast, and a quart of brandy. The complete Simmons recipe is below. Later recipes required lesser amounts to make the cake loaves or baked in pans. Thirty quarts [38 lbs] flour, 10 pound butter, 14 pound sugar, 12 pound raisins, 3 doz eggs, one pint wine, one quart brandy, 4 ounces cinnamon, 4 ounces fine colander seed, 3 ounces ground allspice; wet the flour with milk to the consistence of bread over night, adding one quart yeast; the next morning work the butter and sugar together for half an hour, which will render the cake much lighter and whiter; when it has rise light work in every other ingredient except the plumbs [raisins], which work in when going into the oven. Three pints of water; eight good-sized potatoes, peeled and cut in slices. Boil in the water with a small handful of hops, until tender. Rub through a sieve. Pour the boiling water in which the potatoes were cooked upon the strained potatoes, through a sieve. Stir in enough flour to make a stiff batter. Make the batter very sweet with brown sugar. Add a coffee cup of distiller's yeast. Let it rise twenty-four hours before using. Where the use of domestic yeast is impracticable, that obtained from the distillery can be substituted. Johnson, Ellen Wadsworth. Hartford Election Cake and Other Receipts: chiefly from manuscript sources. Hartford, CT: 1889. 1/2 cup butter. 1 cup bread dough. 1 egg. 1 cup brown sugar. 2/3 cup raisins seeded and cut in pieces. 8 finely chopped figs. 1 1/3 cups flour. 1/2 teaspoon soda. 1 teaspoon cinnamon. 1/4 teaspoon clove. 1/4 teaspoon mace. 1/4 teaspoon nutmeg. 1 teaspoon salt. Work butter into dough, using the band. Add egg well beaten, sugar, milk, fruit dredged with two tablespoons flour, and flour mixed and sifted with remaining ingredients. Put into a well-buttered bread pan, cover, and let rise one and one-fourth hours. Bake one hour in a slow oven. Cover with Boiled Milk Frosting. Put butter in saucepan; when melted, add sugar and milk. Stir, to be sure that sugar does not adhere to saucepan, heat to boiling-point, and boil without stirring thirteen minutes. Remove from fire, and beat until of right consistency to spread; then add flavoring and pour over cake, spreading evenly with back of spoon. Crease as soon as firm. [Spread a boiled icing on a slightly warm cake. Crease with a knife the hardened icing, or else the icing will break when cut]. 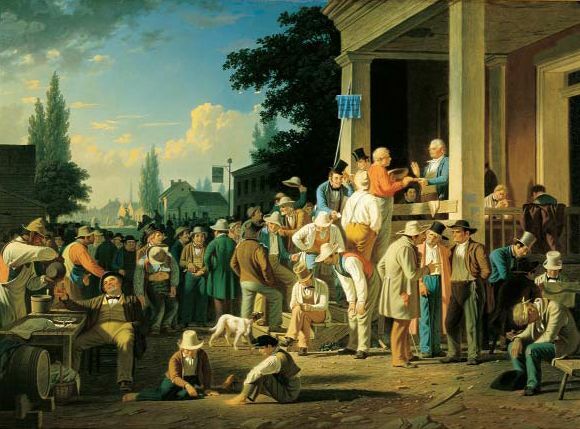 Image: The County Election by George Caleb Bingham 1852 at the Saint Louis Art Museum, St. Louis, MO.